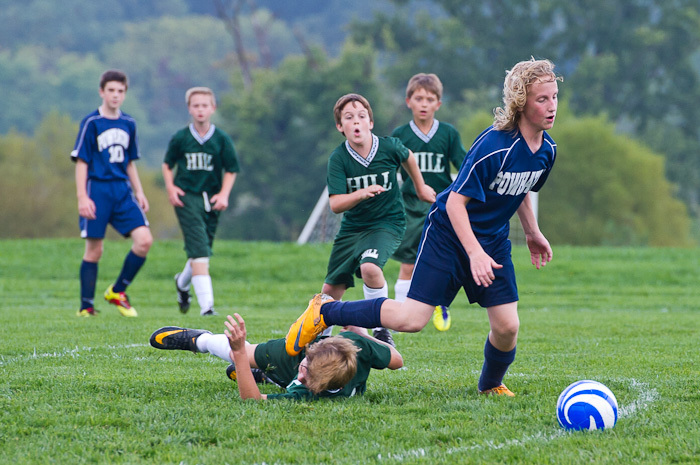 Cameron was thrilled to make the Hill School’s varsity soccer team this season in his first year of eligibility. The sixth-grade class has a strong group of soccer players, and six were selected to join the seventh- and eighth-graders this year as they contest games against area private schools. The season’s first match pitted Hill against Powhatan, and if Cameron (in the background) and the other sixth-graders had thought playing varsity might be a step up in intensity, they weren’t disappointed. The two teams were well matched, but eventually Hill overcame Powhatan’s defense and scored three unanswered goals. Cameron and his classmates—Payton, Connor, Cooper, Jack C. and Cole—made their presence known, and Connor even scored one of the goals with Cameron making an assist. Soccer is always a challenging sport, but when you’re playing against kids literally twice your size you just have to grit your teeth and dig in. And maybe now Cameron will think twice before pushing those vegetables to the side of his plate—it’s time to take advantage of any opportunity to grow a little bigger and stronger. Thank you, Nia! I will take on your next mission, but it might not be right away. I appreciate all of your kind words!